Our lovely staircase, with our lovely Abby waiting patiently at the bottom. I swear that cat is a natural model, she posed right there and sat while I took as many pictures as I wanted. 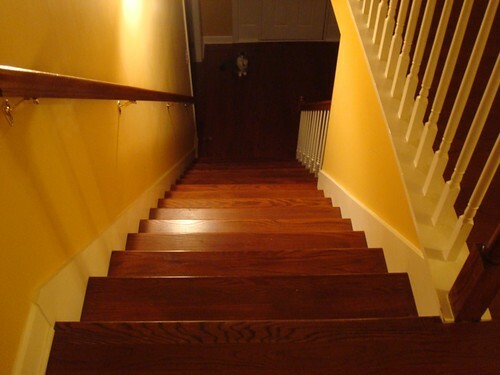 The staircase was a point of much consternation for our cats when we first moved in. Jack figured it out first and was soon dashing up and down the stairs. Abby spent longer taking it one careful step at a time. Of course, she is long since a pro and now unsuspecting stair travelers have not one but two cats to dash up alongside them, throwing them off kilter in their climb.